2 8:18 Consistency. Probably a little fast though. 12 8:56 No one behind me and I was pretty tired at this point. 12.52 4:23 Lots of little turns at the end. There were quite a few choices this weekend in terms of races to do. 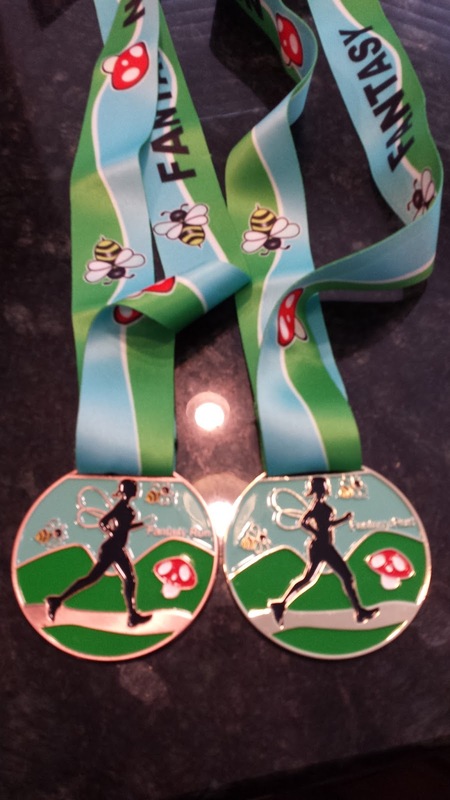 After last weekend's full marathon I had thought I might take the weekend off from racing. But I knew once the weekend rolled around, I'd regret not doing at least something. 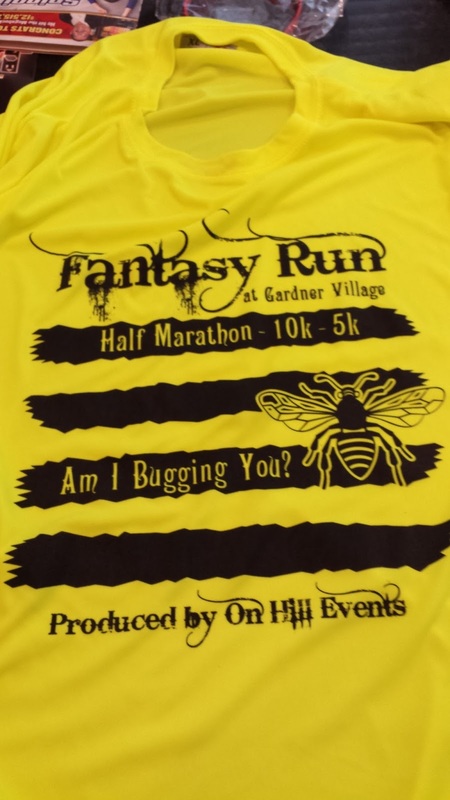 So it was a toss up between the North Ogden Half Marathon (a hilly beast I did last year) or something right around the corner -- the inaugural Fantasy Half Marathon. 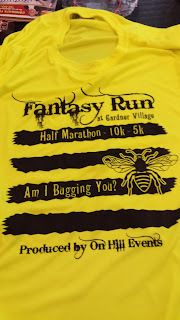 I am not normally into themed races and I think the gist on this one was spring themed. Guys were supposed to be dressed as bugs (with the bumble-bee t-shirt and even antennas) and the women were provided light green shirts with fairy wings. The costumes were optional, but I did wear the bumble-bee tech shirt. 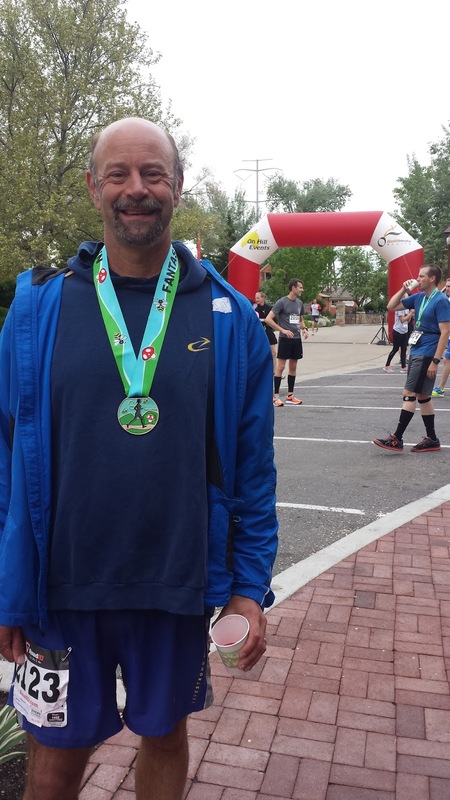 The race was about a mile and a half from my house, so it was kind of a no-brainer but I really had sort of wanted to do the North Ogden one as that course was beautiful and challenging. 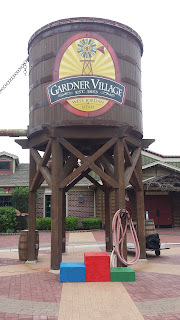 There were plenty of bathrooms at the race as it was held at a touristy / trinket area called Gardner Village. The race started fairly early -- 7 AM, which is great. It was super lightly attended -- maybe 60-ish half marathoners. The 5K and 10K races started a bit later. 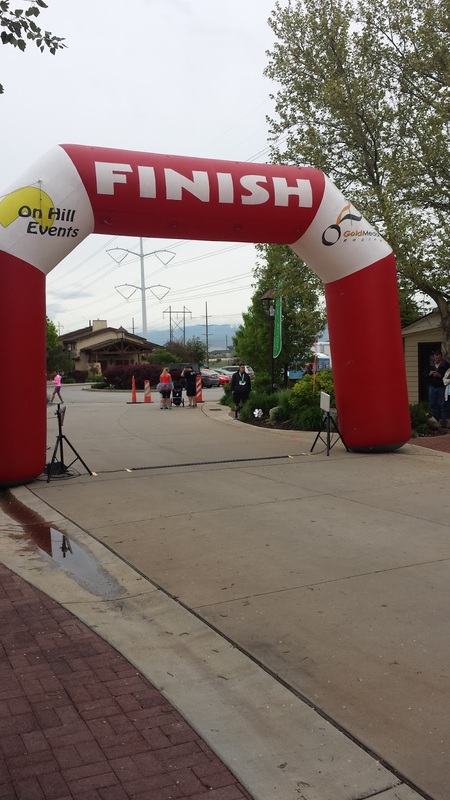 The race was held on the Jordan River Bike Trail. I am super familiar with the course having run on it many times. 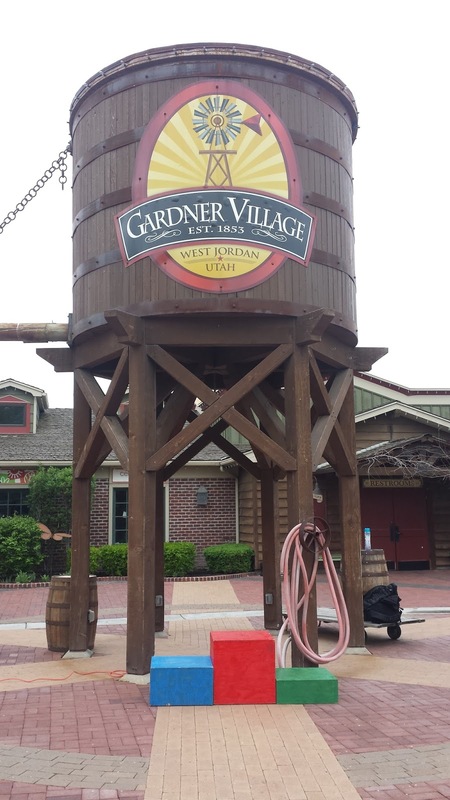 However, the city of West Jordan in the past year completed their section of the bike trail that connected Midvale to West Jordan -- that part I had never been on. At first the route was fairly congested but that only lasted a little while. With only about 60 people in the race it didn't take long until I found myself running for fourth overall in the men's. I knew I was going out at a fairly fast pace on my marathon dead legs. I hit the first few miles at 8:15 (or so) and I felt like the pace was aggressive. Part of me was really worried if I was going to crash and burn badly. While the weather was ideal, I could feel some tiredness in my legs. The course was marked with duct tape and since I knew the route, it wasn't hard to figure out where to go. They had volunteers at key places and water stops were at the 5K turnaround, 10K, 5M and they were passing out gels at the turn around. I was hitting my splits but definitely slowing down as the miles progressed. I certainly didn't want to crash but I knew I was on target for a good race. The turn around came at mile 6.25. There was a person handing out gels and I was a little shocked that it marked the turn around point. I figured I still had another .25 miles to go. Since everyone else was turning around there (at least the few that were within my site) I did too. I was working on trying to make my way past a guy about 15 years my junior and I'd get close to him only to run out of gas. I was passed by the 3rd overall female around the half way point and I tried to keep up with her as well. At the turn around I had spotted some masters aged runners not too far behind me. Since the course was out and back, I had noticed that the lead back were definitely far younger than me. In fact around mile 7 or 8 a walker mentioned to me to continue the pace as I was a definite age group winner. This certainly gave me a lot of incentive. I wound up crossing the finish line in 1:46. I was disappointed that the course didn't measure up to 13.10 miles (most people measured it at 12.50 miles). My overall time -- given my recent races -- also indicate that the race was likely short. The race director said he had taken two GPS units the previous day and had done an aerial measurement of the course as well. There are a lot of electrical towers nearby so they could've had an impact on GPS receivers. If the course was indeed short, it should put my time at around 1:51. After the race, I wound up talking with a few people. To a "T" everyone's GPS read about 12.5 miles. Either way I was pretty happy with my time. The course was flat but did have a few turns to it. Again, I knew the course very well but it has been a while since I've run south on the bike trail. Being the race was pretty small, I knew I was going to win an age group award, which was a near copy of the finisher's medal -- except the age group one is color coded (gold in my case). I was happy with my experience and this was totally low stress. I had picked up my shirt / bib the day before, so I rolled into the race site about 20 minutes before the start. The medals were definitely nice (although a little effeminate) and the shirt was good. The cost of the race was a little over $60. I had registered for the race about 2 weeks before so all things considered, a decent price. Hopefully the distance gets corrected (the 5K and 10K appeared accurate).